It doesn’t matter if you have a green thumb or not, gardening is a great activity that you should try at home. 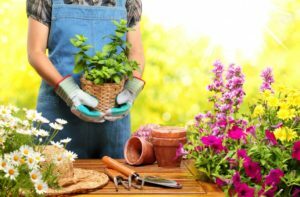 Whether you want a big garden in your background, a window garden, a standing herb garden, or a small greenhouse, you can definitely enjoy a lot of great benefits to your health, home, and wellbeing if you choose to start gardening or setting up a greenhouse. Here are 4 of those advantages. Consider these as more reasons to buy a small greenhouse to add to your home. It’s great for your health! Studies have shown that greenhouses can benefit people suffering from Seasonal Affective Disorder or SAD. How? Through diffused lighting. According to Health Navigator NZ, SAD is most common among people between 20 and 30 years of age and is more common among women. The most common symptoms of SAD include low mood, feeling like crying, having no interest in things people normally like, feeling anxious, and less sleeping and eating. As having a greenhouse means you can enjoy gardening year-round in a fixed environment, it can help you fight the symptoms of SAD, especially during the cold months. Gardening is both a lonesome and community activity. Forget book clubs, use your greenhouse to socialize and build a community of new friends in your neighbourhood who like doing the same thing. This can help you find kindred spirits who also love gardening. Hosting events in a greenhouse can also be a great conversation starter. A sizeable one can also double as an entertainment space. Lastly, having something to share with people helps you fight the symptoms of SAD. Herbs are one of the best things to grow in a greenhouse. If you have a small greenhouse at home, you can better grow quality herbs to give to friends or sell to the community for extra income. If you have a green thumb, you might as well put it to good use. You can also grow and dry some herbs to make tea, or maybe grow exotic plants and herbs to sell or share with the community and enter in contests. You can enjoy your garden year-round! Having a greenhouse allows you to work in a controlled environment. Whether it’s raining or the sun is shining brightly outside, you don’t have an excuse not to spruce your produce in the greenhouse. But more importantly, gardening is a physical activity. It can also help you in keeping a healthier eating habit. In one study, researchers found that people who garden ate more vegetables and fruits compared to those who don’t. The participants in the study also produced what they ate in their own garden. So, what are you waiting for? If you’ve always wanted to try it, there is no better time to start than today. Buy a small greenhouse and start to plan what types of herbs, fruits, and vegetables and flowers you’re going to plan this year.